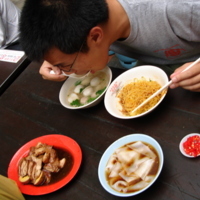 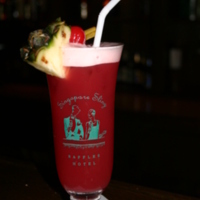 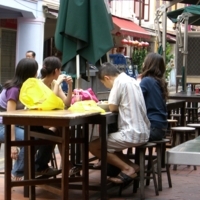 In the summer of 2006, Professor Phua and five students (LiFong Chen, Emily Harsen, Douglas Kaufman, Jason Loh, and Conor Quinn) went to Singapore on a research trip to study the social construction of Chineseness among Chinese Singaporeans. 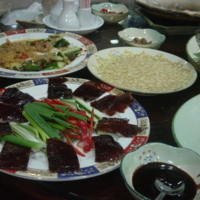 This selection of images was taken during the trip and is organized into three categories Food, Religion and City. 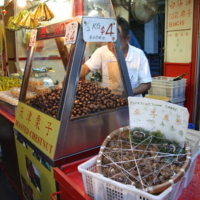 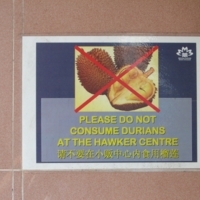 Durians are banned in Hawker Centers because of their strong smell, which some love and some hate. 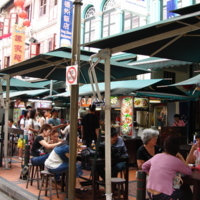 A row of food vendors and their tables in Chinatown. 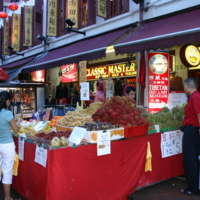 Shoppers look at produce from a fruit stand in Chinatown. 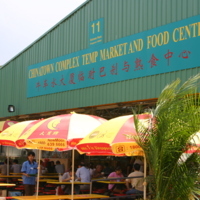 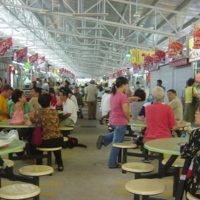 A typical Hawker Centre where food stalls are lined up.